How do we reclaim the integrity of our food and get back to producing good, clean, fair food for everyone on the planet? His Royal Highness The Prince of Wales thinks he has some answers. Rodale Press, famous for its organic gardening books, has packaged a 64-page minibook that outlines the Prince’s take on the problems and solutions facing world agriculture. He offered these thoughts during in a speech at the conference on “The Future of Food” at Georgetown University in Washington, D.C. This is the challenge facing us, he said. We have to maintain a supply of healthy food at affordable prices when there is mounting pressure on nearly every element affecting the process. “In some cases we are pushing Nature’s life-support systems so far, they are struggling to cope with what we ask of them,” the Prince said. “Soils are being depleted, demand for water is growing ever more voracious and the entire system is at the mercy of an increasingly fluctuating price of oil. 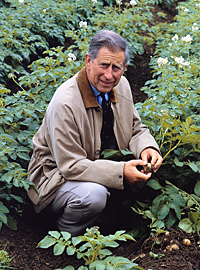 Having read the Prince’s speech, I would caution that world agriculture is not going to hell in a hand basket. Large scale food production is not killing the planet. Here in California, the nation’s most productive farm state, growing food is business, passion and art. There are problems and challenges, sure. But, from my perspective, fear mongering and a siege mentality will not fix or expand the world food supply. The alarmist attitude might even get in the way of finding real solutions locally and around the world because its so polarizing and fear predicated. Making ogres of those who put food on the dinner table will not improve the abundance, variety and price of what we eat. It is a disservice to those who’ve dedicated their working lives to delivering food to a hungry world to suggest otherwise. What food we can produce in small garden plots will not satisfy global food needs. To suggest that is the case is wrong, even dangerous. Rodale Press says THE PRINCE’S SPEECH seeks to both answer an important question and spark a global dialog about what tangible changes needed to be made to our food systems. That seems like a useful discussion, but scaring people into thinking current food production systems are ravaging the plant is rediculous, suggesting that it may be too late and the end is near is just plain silly. Agriculture has endured from the beginning of time through incremental improvements and adjustments. An example is the work of American agronomist Norman Borlaug who led the introduction of high yielding wheat varieties to Mexcio, Pakistan and India that greatly increased yields. These yield increases have been labeled the beginning of the Green Revolution, and Borlaug is often credited with saving more than a billion people worldwide from starvation. He was awarded the Nobel Peace Prize in 1970. The earth’s resources are both precious and resillient and a wider public understanding of the issues can only help in their sustainable use — but not because the sky is falling. THE PRINCE’S SPEECH includes a foreword by author and farmer Wendell Berry and an afterword by urban farmer Will Allen and bestselling author Eric Schlosser. $6.99. Although I can’t find any place where it’s explictly stated that proceeds from the sale of the book go to the Grace Communications Foundation, it looks like the Prince has an affiliation with the organization. The financial split–author, publisher and foundation — isn’t spelled out. Grace said it educates consumers and advocates for policies that address the environmental and public health effects of industrial food systems and supports the development of sustainable food distribution networks: www.gracelinks.org. 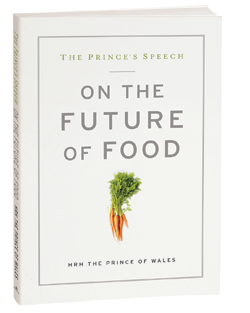 The Prince’s complete speech is available free on his personal website for those who’d like to save the cash and use a more sustainable approach to reviewing his stance on the issues of food production. All the private and the large majority of the official and charitable activities of The Prince of Wales and The Duchess of Cornwall are funded by The Prince’s annual private income from The Duchy of Cornwall estate, according to the Prince’s personal Web site. It says that since it was established in 1337 by Edward III for his eldest son Prince Edward, the Duchy’s main purpose has been to provide an income for the Heir to the Throne. 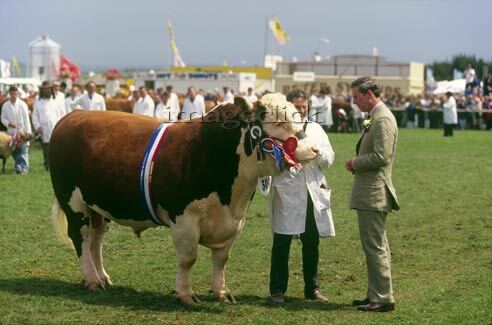 Today, the estate consists of about 54,424 hectares (about 135,000 acres of agricultural land) with farming operations in 23 counties, mostly in the South-West of England, and includes agricultural, residential and commercial property holdings. It also has a financial investment portfolio. The average size farm in the U.S. is about 400 acres, the U.S. Department of Agriculture reports in its census of agriculture.